Let’s start with a tour of the basics from Learn.Genetics at Utah. Sickle Cell Anemia: A Mutation Story from the excellent Evolution Library. Question: What do HBB, PAH, PKD1, NF1, CFTR, Opn1Mw and HEXA have in common? 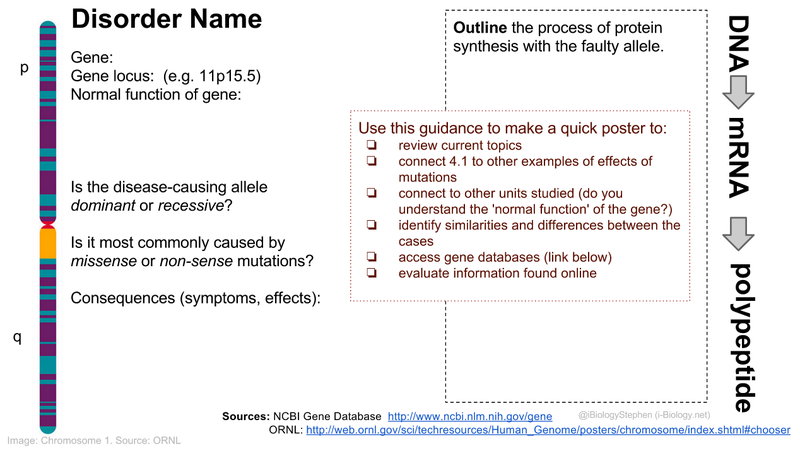 Answer: They are all disorders causes by base-substitution mutations. Assign groups by handing out cards with the codes above (we had already studied HBB, so didn’t include it) and asking them to find each other. Give them the instructions – to produce a simple poster & 1-minute overview of their disorder, using the guidance in the image below. Go. Lots of discussion, lots of questioning. If students get stuck, they need to look it up, evaluate their sources and keep on going. Check they’re on the right track: HBB (sickle cell), PAH (PKU), PKD1 (polycystic kidney disease), NF1 (neurofibromatosis), CFTR (cystic fibrosis), Opn1Mw (medium-wave sensitive colour-blindness), HEXA (Tay-Sachs disease). Groups present to the class what they have found. What similarities and differences do we see? What are the normal functions of these genes and how does this connect to our understanding of proteins, channels, pumps, etc. Poster outline for the 30-minute inquiry. does anyone know why when im on this website thru my school network i cant view the stephan taylor powerpoints? Maybe your school’s wifi blocked the site “slideshare”! I’m a little confused. The first slide in the topic presentation talks about an interesting genetic activity: Crooked Cell Case Study. At the end of the case study it says “Consolidation: Use the class presentation and worksheets to complete notes on the section…Read ahead and get an idea for the subject of Genetics.” Do you provide some traditional lecture for the topic and then have students perform this activity to go further in depth for the associated assessment statement/s? Good question. We start on the case study and then move onto using that to look at the content. It’s not a lecture, as all the resources are here, though if formative assessment and class discussion suggest some or all are having problems with bits of content, we’ll do short sections. I actually don’t use the worksheets any more – but leave it up here as some teachers like them.